This recipe takes a bit of preparing but is well worth it if trying to impress family or friends. It makes a good starter or a light lunch. I used some fantastic smoked anchovies from Fyne Fish in Cockermouth. You can use anchovies from a tin but they are too salty for this recipe so halve the amount of fillets, and oil for the dressing (substitute some good olive oil). In a bowl add 200ml of water and a hand full of ice, mean while heat a pan of salted water up to the boil. When boiling add the quail eggs carefully with a slotted spoon (eggs must be at room temperature). Cook the eggs for exactly 2 and a half minutes and then transfer the eggs to the ice water. This will stop the eggs cooking so that they are still runny inside when serving. Leave for about 20-30 minutes. As the eggs cool you can prepare the dressing, just add the anchovy oil, vinegar, mustard and shake together in a small jar. You can adjust ingredients to suit your personal taste, season well with salt and pepper. Layout 3 bowls, one with the flour (season well with salt and pepper), one with the whisked egg and one with the bread crumbs. When the eggs have cooled. Peel them carefully. Top tip: Peeling the quail eggs can be a pain, allowing them to fully cool will help. Just take your time and try and peel from the skin type membrane thats just under the shell, this will make it alot easier. If you do start taking out chunks of the egg not to worry as the breadcrumbs will hide some mistakes. Roll the eggs in the flour, then the egg and then the breadcrumbs until fully coated and set aside. Add the vegetable oil to the pan or wok, you need about an inch of oil, heat it until it hits 180c (you can test it by dropping a pinch of the breadcrumb mixture to the oil. If it rises to the top and starts to sizzle then the oil is ready). Carefully lower the eggs into the oil, and cook for about 3 minutes or until golden all over, you will have to turn them half way through cooking. Assemble the salad leaves and drizzle the dressing all over, take the anchovy fillets and scatter on top of the leaves. 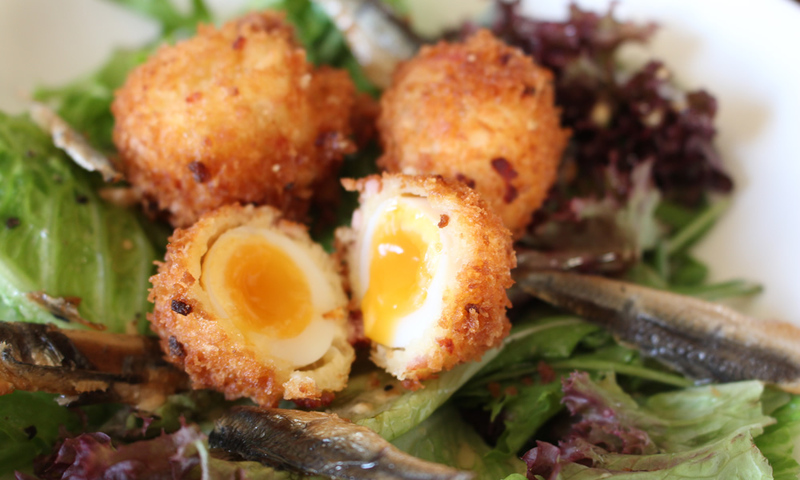 Finally place the deep fried quail eggs to the middle of the salad.